As you may or may not know, most of us at the shop are somewhat avid fans of Stephen West’s work. His designs have such a sense of whimsy, and yet are entirely wearable (and many of them, thankfully unisex!) It was no surprise to find Anina knitting up one of his latest designs, Kvosin, which is from the ever so poignantly named ‘Westy’s Besties‘ KAl collection he’s put out on Ravelry. 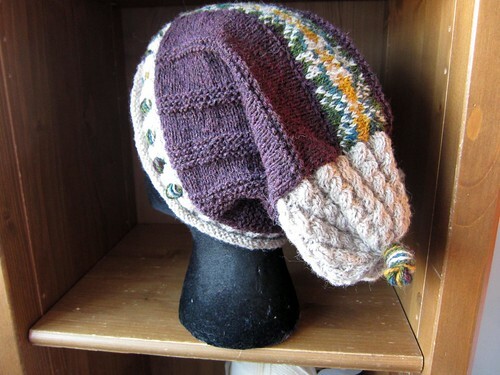 Anina substituted the Harrisville Designs New England Shetland, and I think her colour choice was fantastic. 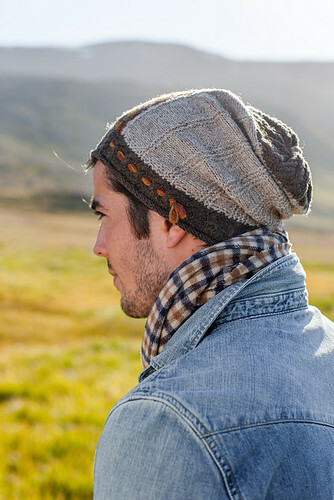 And there’s the slightly more masculine version, sampled from the pattern library on Ravelry. In other news, we are now offering a tough to name, colour control system. A picture will help. 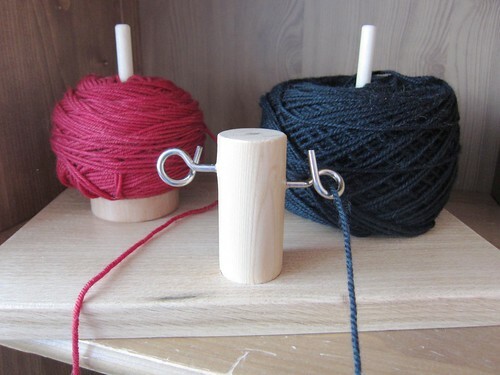 Each cake of yarn sits on a spinning base, allowing you to knit stranded colourwork while helping to keep your yarns from getting tangled and snarled together. These are made custom by a local artist, and the last time I checked we only had the one available for display, but you can custom-order them from the shop (call, e-mail, come by and visit if you would like more information). 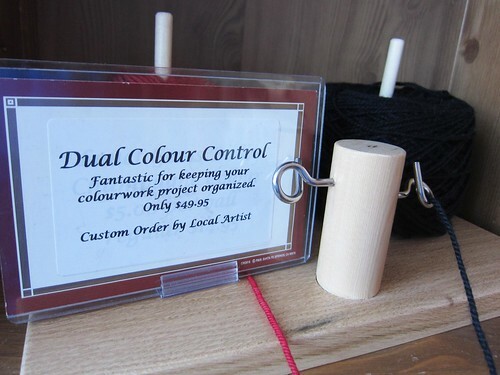 This is a really simple, elegant device – I know I’ll be thinking about it when I start planning my next colourwork project! This entry was posted on Monday, March 25th, 2013 at 8:45 am	and is filed under Uncategorized. You can follow any responses to this entry through the RSS 2.0 feed. Both comments and pings are currently closed.